In some European nations, the number of people considering themselves to be non-religious has increased from around 30% in 1980, to over 90% now. * Although large numbers of Muslims populate the continent, a substantial portion are now only "culturally" Muslim, rather than having a literal interpretation of the Koran. Mainstream Islam has begun a reformation and modernisation in recent years – aided by vast improvements in education, combined with the broad homogenisation of culture resulting from globalisation, the Internet, various international agreements and other factors. Medical advances are undermining religion as a whole, by greatly diminishing the fear of death, while developments in AI, robotics and biotechnology are beginning to trivialise the miracles on which many ancient religions are based. The increasing presence of androids in society – along with other forms of sentience – is adding a whole new dimension to the way humans view themselves and their place in the Universe. The ability to communicate with certain artifically enhanced animals (such as dolphins, monkeys and domestic pets) is also contributing to this trend. Spirituality continues to play a role in European cultures – but is now based more on nature and physical reality, rather than myths, dogma or supernatural forces. The USA still lags far behind Europe in terms of atheistic belief, however. It will be another century before America reaches the same level; even longer for certain parts of Asia. Even then, a small percentage of citizens will continue to worship a God (or Gods), well into the next millenium. These people will tend to be those who reject science and technology, or have purposefully chosen to isolate themselves from the rest of the world. With speed of this magnitude, any city within the network can be reached in just a few hours, even if located on the other side of the planet. A number of new routes are in the planning stages as well, including a system of truly massive transoceanic connections. This is possible thanks in part to the relative cheapness (10% the cost of high-speed rail), as well as its energy efficiency. Since the train cars simply coast for most of the trip after being accelerated, slowing down also allows most of the energy to be regained by the track system. The modular design of tubes enables construction to be automated. One of the main issues designers had to contend with was the problem of safety. At such high speeds, even the slightest bump in the track or misalignment could end in disaster. In addition, the sheer size of the tube systems means that engineers have to deal with the movements of tectonic plates – a particular problem when crossing fault lines. In order to deal with this and disasters such as earthquakes, an immense system of gyroscopes and adjusters are maintained along the length of each route. These are controlled by an automated system of computers receiving constant streams of weather and seismic data, adjusting and bracing the track in real time. Leaks into the vacuum are managed through a combination of self-healing materials and redundant plating. The late 21st century is a bleak, fragile time for humanity, with much rebuilding to do. However, the resurgence of international travel (following a collapse in earlier decades) is contributing once more to a homogenization between stable countries, with ease of transport bringing the world closer together. One particular area in which this helps is for rapid movement and resettling of refugees affected by climate-related disasters. On 6th February 2018, U.S. aerospace company, SpaceX, conducted the maiden launch of the Falcon Heavy, a partially reusable heavy-lift launch vehicle designed to transport people and cargo beyond Earth orbit. * The rocket was carrying a Tesla Roadster, which belonged to SpaceX founder Elon Musk, as a dummy payload. Inside the electric sports car was a mannequin, nicknamed Starman, who appeared to "drive" the car while wearing a spacesuit. The Roadster, released upon reaching outer space, had sufficient velocity to escape Earth's gravity. It entered into an elliptical heliocentric orbit that would eventually cross the orbit of Mars, reaching a maximum distance from the Sun at aphelion of 1.66 AU. 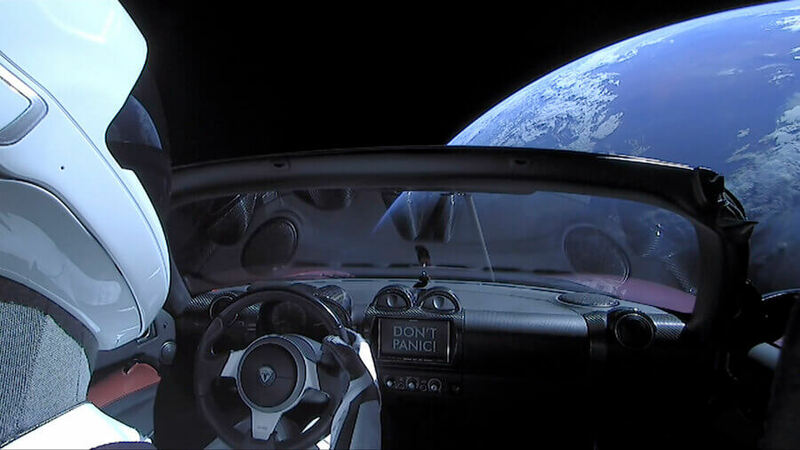 In 2091, after a period of 73 years, Starman returns to cislunar space and makes a close approach of Earth. * He continues to circle the inner Solar System for millions of years into the future, with a small probability of colliding with Earth (6%) and Venus (2.5%) during the first million years. As a result of global warming, temperatures at the poles have risen more than anywhere else in the world – meaning that parts of Western Antarctica are now comparable with the climates of Alaska, Iceland and northern Scandinavia. In some areas, melting of surface ice has resulted in conditions appropriate for large-scale human settlement. * The icy continent today would be unrecognisable to observers from the 20th century: its northern peninsula is now home to a multitude of towns and conurbations, with a total population numbering in the millions. Even farming and crop growing is now possible in some of the most northerly areas, using genetic modification techniques. Rapid immigration from countries all over the world has created a diverse mixture of people and cultures flocking to this new land of opportunity. In a way, the settlement of Antarctica is similar to that of America in the 18th and 19th centuries. The highest density cities are becoming cultural melting pots similar to London and New York, though on a smaller scale. 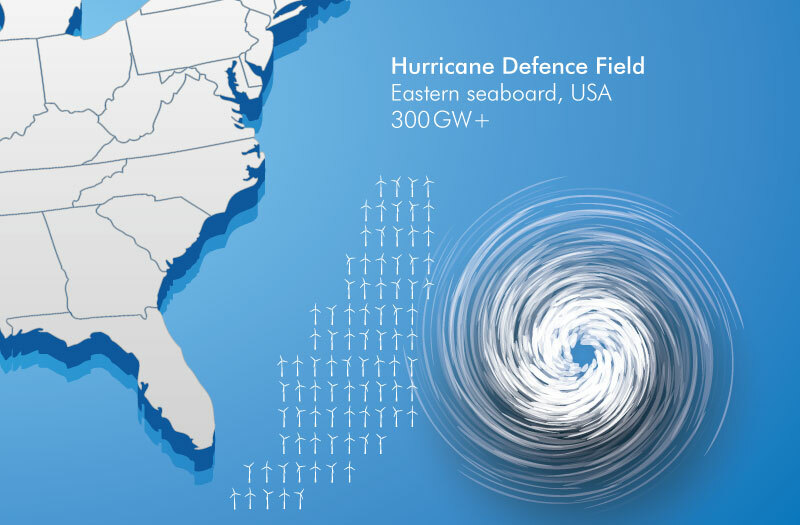 Hurricane defence fields are operational in the U.S. Compared to other forms of energy production, offshore wind power emerged relatively late in the modern era. Although land-based turbines had been around for centuries in some form, their offshore equivalents did not arrive until the end of the 20th century. The first commercial offshore wind farm was constructed in Denmark in 1991 and consisted of 11 units generating less than five megawatts (MW). The project was viewed with scepticism at the time, but the experience it provided led to cheaper and more efficient designs. Despite some downsides, offshore wind proved to have the major advantage of capturing much stronger and more persistent winds at sea. It could also be sited close to load centres along coasts, such as large cities, thus eliminating the need for new long-distance transmission lines. Furthermore, NIMBY opposition to construction was usually much weaker. Following the first installation at Denmark, more projects began to spring up around Europe in the 1990s. However, it remained a niche industry and would not take off until the early 21st century. The UK opened its first offshore wind farm in 2000, which had a modest capacity of just 4MW, but then rapidly developed much larger projects, overtaking Denmark to become the world leader by 2008. It also became home to the single largest project in the world – the 175-turbine London Array – completed in 2013. Europe as a whole boasted 11GW of capacity by 2015, more than 90% of the global total. Offshore wind, like solar power, was poised to become one of the exponential growth industries of the 21st century. The U.S. Department of Energy estimated that the country had a gross resource potential of 10,800GW and a "technical" resource potential of 2,058GW – enough to power the whole of the United States. More and more projects were getting underway as developers realised the economic, social and environmental benefits of this abundant form of energy. Improvements in technology and cost, alongside increasing concerns about climate change, led to renewables playing a greater and greater role in the energy mix of the United States. By 2050, the nation was generating more than 86GW of electricity from offshore wind. * The South Atlantic states, continuing the trend from earlier years, experienced particularly strong growth. These had the largest technical resource potential of any coastal region: nearly 30% of the U.S. total. 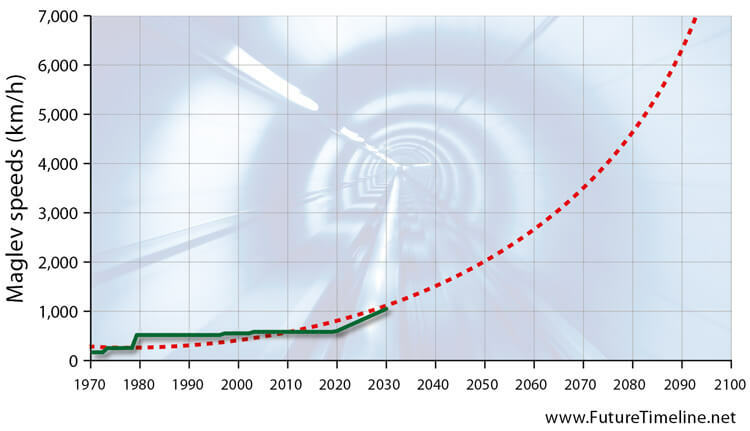 With fossil fuels now rapidly heading for obsolescence – and next-generation turbines being deployed in enormous numbers – the second half of the 21st century would provide even greater opportunities for expansion. Advances in wind technology continued to reduce the cost, while boosting the efficiency, scalability and durability of turbines. Powerful artificial intelligences were now emerging to handle the planning, construction, operation and maintenance of wind farms, using vast teams of robots, drones and other automated systems. Among the most promising breakthroughs were floating platforms, which allowed turbines to be sited further out to sea (rather than needing part of their structure to be anchored in the sea floor). 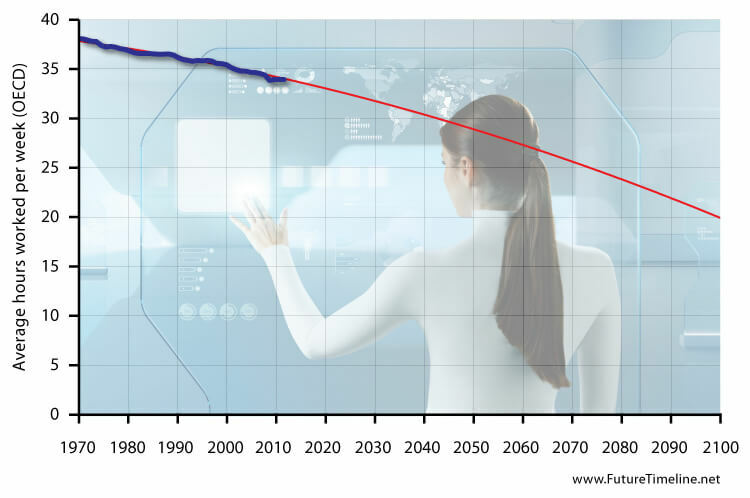 This had been a niche sector throughout the 2020s, but became cost-competitive during the 2030s and grew markedly from that decade onwards. * Another design that became popular was ice-resistant floating technology. While not particularly useful in the Atlantic, Gulf of Mexico or Pacific, it helped to increase the resource potential of the Great Lakes region, making projects there more adaptable and sturdy. New super-strong but lightweight materials were enabling wind turbines to reach great sizes. From a few tens of metres in the 1990s, they increased to heights of 260 metres (853 feet) by 2021 and then grew even taller over subsequent decades. This was accompanied by an order of magnitude boost in their capacities, allowing tens of megawatts for a single turbine. During the second half of the century, wind farms established in the Atlantic became so large and widespread that some began to merge and combine to form gigantic networks spanning hundreds of miles. 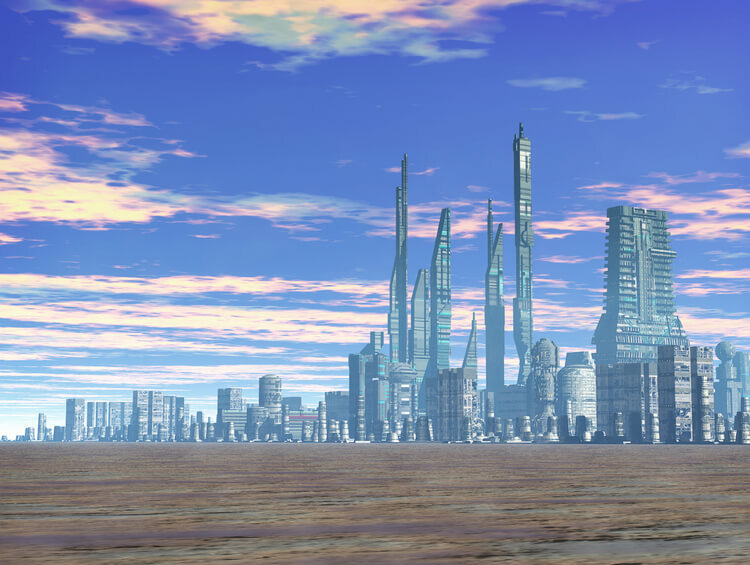 What had seemed like "megaprojects" back in 2050 were being dwarfed in scale by the new proposals organised by super-intelligent AI, which had an increasingly strong pull on the reins of the economy. Initially serving in a mere advisory role, these sentient programs were gaining ever more control in terms of energy and resource utilisation. Their capabilities were becoming strong enough to reshape not just the political and economic sphere, but the physical and natural systems of Earth itself. Recognising the existential threat of climate change, the AIs began to implement one of their most important long-term plans. By 2100, the South Atlantic states are generating over 300 gigawatts of offshore wind power – fully half of their technical resource potential. In addition to providing abundant clean energy, these vast networks now serve an incredibly important extra function: the sheer scale of wind farms now spread across the coasts is sufficient to interact with and alter the strength of approaching hurricanes. These hurricane defence fields are not infallible and many other impacts of climate change remain to be solved. Nevertheless, the ability to partially control an aspect of the world's weather system is hailed as a major milestone in the fight against global warming. From a historical perspective, it represents a significant step towards humanity becoming a Type 1 civilisation on the Kardashev scale. * Other regions are taking similar measures too – such as the typhoon-hit nations of Southeast Asia. 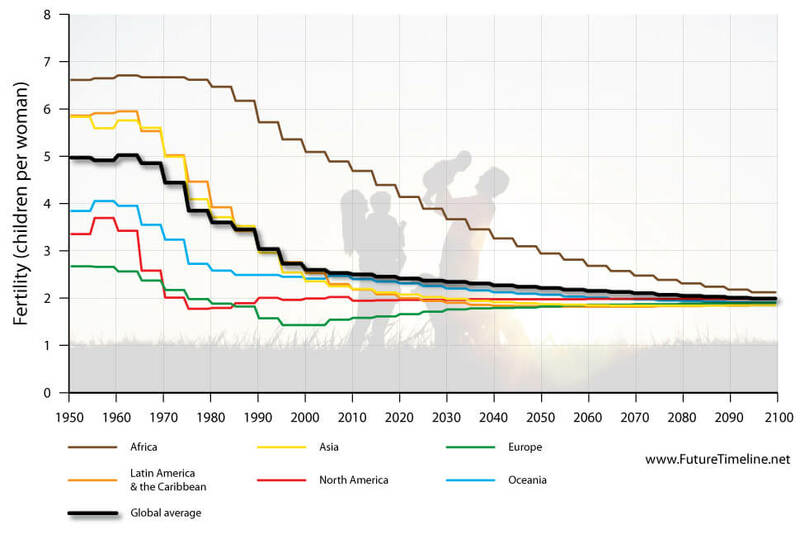 By 2095, the global average number of children per woman has dropped below two, with even Africa now approaching this level after 130 years of declining fertility. * There is now a remarkably similar rate between all regions on Earth – due to a range of factors including better education, improvements in health and living standards, access to contraception and shifting cultural perceptions on the value of children, ideal family size, etc. Increased globalisation has resulted in the number of human languages declining from around 7,000 during the late 20th century, to less than half of that figure now. * Many old sayings, customs and traditions have been abandoned or forgotten as the world becomes an ever smaller and more interconnected place. Changing social and economic conditions have forced many parents to teach their children the lingua franca, rather than obscure local dialects, in order to give them a better future. This is especially true in Africa and Asia. This broad homogenisation of culture has been further propagated by the stunning advances in technology which have swept the world. Many people in developed countries, for instance, are eschewing their native tongues altogether, relying on brain implants for everyday communications. The young especially are utilising this form of digital telepathy, now sufficiently advanced that verbally speaking has almost become an inconvenience, due to the longer time intervals required in conversations. Meanwhile, tribes people and isolated communities have lost homelands due to climate change, deforestation and shifting land uses. This forced migration and assimilation into the wider world has caused many ancient and rural languages to fade away. 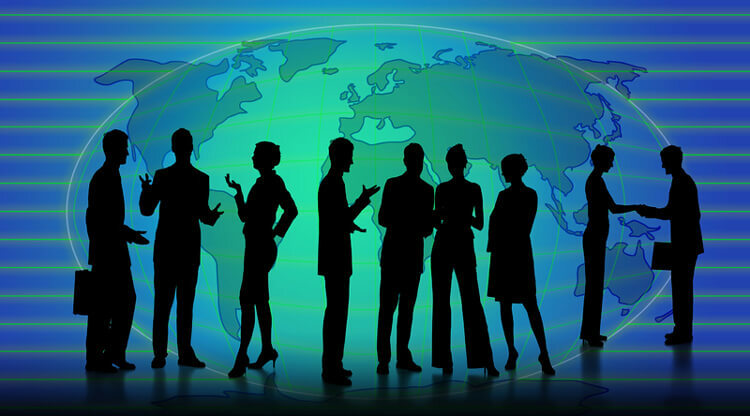 English, Mandarin and Spanish remain the lingua franca of international business, science, technology and aviation. Despite efforts to halt climate change, it came too late to save many lowland areas of the world. Sea levels rose almost two metres by the late 2090s, displacing hundreds of millions of people. * The Maldives were especially hard hit, with most of the nation disappearing underwater. * Countries around the globe were forced to begin large-scale evacuation and resettlement programmes, while trillions of dollars were spent on coastal defences. Due to the combined impacts of logging, drought, forest fires, desertification, agriculture and industrial expansion, less than one-fifth of the Amazon now remains. * In addition to mass extinctions of flora and fauna, many indigenous peoples' communities have vanished. A portion of the Amazon rainforest, 2000-2012. Animation created by Will Fox, using imagery from NASA. In the early 1800s, most people in America and Europe worked shifts of 70-90 hours per week, or even longer during busy periods. ** Conditions were often cramped and dangerous, pay was low (or non-existent in the case of slaves) and workers had little in the way of rights. Later in the 19th century, a growing labour movement led to improved workplace regulations. A series of laws were introduced to improve safety and to limit the hours worked by employees – particularly women and children – while slavery was abolished throughout much of the world. Further progress was made in the 20th century with the introduction of minimum wage laws, the emergence of five-day workweeks and continued growth in union membership. In 1900, a typical U.S. citizen worked 57 hours per week and this had fallen to 49 hours by the 1920s. Working hours fell sharply during the Great Depression, especially in manufacturing, but rebounded during World War II. In the post-war boom years, the average length of workweek in the U.S. continued to fall, but at a slower rate than before, hovering at around 40 hours. There was a faster decline in Western Europe, however, and in the OECD as a whole. On both sides of the Atlantic, union membership declined substantially in the 1970s and 80s, though progress continued to be made in employment law. In the 21st century, these trends continued. In the first few decades, this occurred alongside further changes in the workforce, with telecommuting and flexible business hours making work in developed nations more dependent on worker preference and efficient productivity. ** In addition, this period witnessed the gradual loss of traditional labour as computer intelligence and automation proliferated. * This led to serious disruption as employers attempted to adapt productivity to the growing surplus of workers. The growth of personal manufacturing in the form of 3D printers and nanofabricators, alongside increasingly common means of local power generation, began to significantly alter the economy itself. As production became more and more decentralised, work became less and less of a requirement for basic living. Spending on necessities like food at home, cars, clothing, household furnishings and utilities – as a share of disposable functional income – had already declined from 55% in 1950, to under 35% by the 2010s. * With such items becoming producible on a personal and community scale, work hours in many places were gradually becoming a matter of choice rather than need. This revolution in manufacturing, combined with exponential growth of computer intelligence, would eventually change the nature of work itself. With an ever-growing share of the economy based on information technology, the average job was becoming more creative, personal and intellectual. By the latter half of the 21st century, artificial general intelligence had penetrated much of the business world, allowing workers to share tasks with computers able to operate with little or no human intervention. 2 "Swiss company Acabion sees such vacuum tube-based mass transport systems becoming a reality by 2100 and ... envisages a global network that would let users circle the globe in less than two hours and make transcontinental journeys possible in less than the time it currently takes to get across town." 3 "...China should target the development of high-speed ground transportation with 600 to 1,000 kilometers per hour which should be in operation between 2020 and 2030." 4 "If ETT does see the light of day it is estimated to travel at a top speed of 4,000 mph. That's more than mach 5! More than only the fastest record-breaking jets! At 4,000 mph, a trip from Washington DC to Beijing would take just two hours."